Made in the USA by Goodyear Tire & Rubber. Smooth riding and sure to put a smile on a Concours Judge's face! Please order your tires carefully. Let us help you. If you need to return tires and it is not our fault, there is a 20% re-stocking fee. 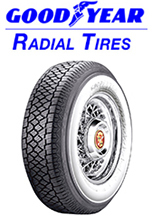 Tires must be returned in the same condition as shipped and not mounted. We cannot accept tires that have been mounted. 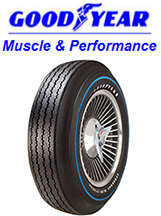 Goodyear tires for muscle and high performance cars. 760-731-8303. Polyglas, Power Cushion, Speedway 350, red lines, thin lines and raised white letters RWL tires.